Needless to say there have been many, many books over the years (official and otherwise) showing you how to draw your favorite characters from Disney Animation. 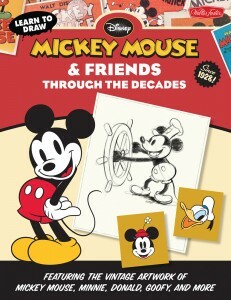 This latest book from the famous Walter Foster art how-to series takes a little different tack: How the look of Mickey Mouse and some of the most well-known Disney characters has evolved over time since they were first created. “A collection of vintage artwork from the Disney archives reveals early designs, sketches, and poses of Mickey Mouse as well as other classic characters such as Minnie Mouse and Donald Duck. Learn to Draw Mickey Mouse & Friends Through the Decades creates the opportunity for an artistic celebration of the world’s most beloved mouse, by bringing together a collection of step-by-step projects and inspirational illustrations for rendering these timeless characters as they originally appeared. Featuring 128 pages of art instruction material, this title makes a covetable collector’s item for any loyal Disney enthusiast or aspiring artists interested in learning to draw in classic cartoon style.” Learn to Draw Mickey Mouse & Friends Through the Decades (whew, long title!) is coming next year to Amazon and other sellers.